C’mon, Who Really Wrote it? : Harriet S. Adams in 1946. No more Leslie McFarlane. But this is the same Ms. Adams who rewrote both books 1 and 2, so she’s not new to this game. Was It Revised? : Yes, in 1969 by Priscilla Baker-Carr. Cover: Rudy Nappi. More orange than red, and Frank is really letting down the side by wearing blue, but I quibble. This is a great cover, full of action and menace. Look at the threatening shadow on the wall! Nicely done. Setting: Bayport, and seemingly 10 minutes drive in every direction from there. Read the book to get that. You know what astounds me? The crooks in this story move from city to city for their nefarious deeds. They set up in a new city, pick a local hideout, steal and then move on. So here’s my question: If Bayport is world famous for harboring the world-famous detective, Fenton Hardy, and his sharp sons who are also world famous, what idiot crook thinks that’s the spot for them to set up? Where’s Fenton This Time? : He’s good this time. He’s on the sidelines doing his thing, but when the boys get into a very serious scrape, we see Fenton on his game. He cooly and methodically figures out how to save his sons. It’s exciting to finally seeing the master in action. Which Chums Show Up? : Chet, with Callie and Iola popping up a few times, and they even help out in the case briefly. Phil gets mentioned once but does not actually appear. What’s Chet’s Hobby This Time? : He bought a boat. Which he promptly loses. Then never buys another one again. Natch. Plot: A house with no visible locks, and a man who is supposed to have died showing up looking very much alive. Add some crooks who decide to make the lockless house their hangout, and you’ve got trouble, right here in Bayport city. Review: A nice one. There’s a marvelously creepy scene where one brother hears the other say, “let’s go” as they are exploring a deserted house. Only it wasn’t the other brother saying it. And the person saying it has no idea the brothers are present. Very well done scene. 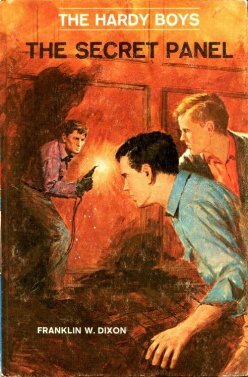 Nice exploration of locksmithing, Fenton gets to shine, it all takes place in Bayport, the secret panel is a rough fate to experience. I like this one.